A sign to indicate WiFi set up in a spot that the OCVB subsidized. Beginning in 2012, in the first fiscal year, the bureau completed 64 translations of menus and brochures of restaurants and tourist spots and set up WiFi in 154 locations. The projects are ongoing to further enhance the satisfaction of foreign tourists. As translation support, companies receive a maximum of 10,000 yen for each job in a certain language. Each company can receive support on three jobs. For the installation of WiFi, the government subsidizes a maximum 30,000 yen for a building. 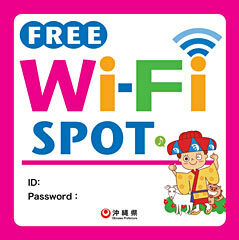 Okinawan companies filed 45 applications for translation support and 32 for installation of WiFi. Foreign language services recorded the lowest level of satisfaction in the government survey on foreign tourist satisfaction levels carried out in 2012. There were also many requests for WiFi to be set up. Based on the results of the project to date, the bureau is calling for companies to apply for support to promote tourism. The bureau will provide subsidies until February 28 next year. For further details, call the Overseas Project Department of the OCVB on 098 (859) 6130.